1.1 Need Help with a Mozilla product? Welcome to the Berlin office! We're glad to have you here! Need Help with a Mozilla product? For fast and easy support go to Mozilla Support Please understand that Mozilla, as a non-profit, cannot provide phone support. 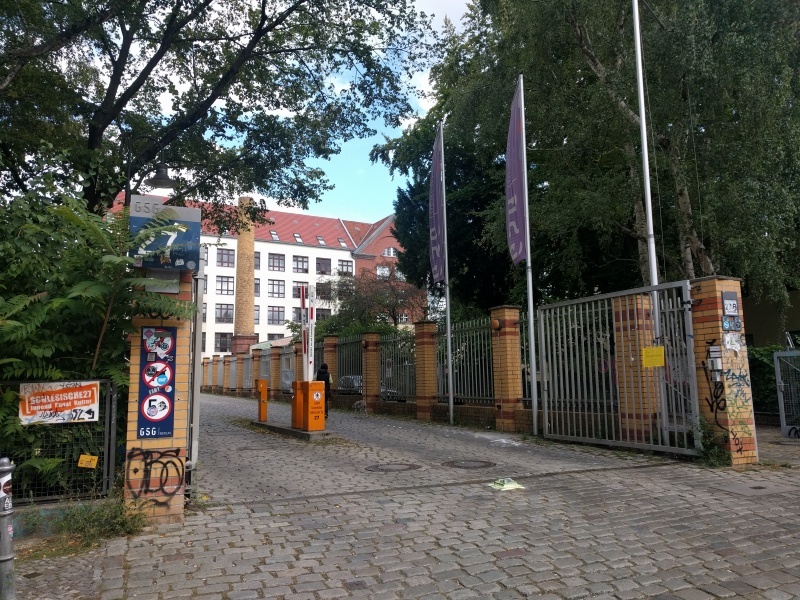 To access the building use the driveway to the courtyard of Schlesische Strasse 27 and go straight until the end of the area. Then enter Haus 3 entrance C on the lefthand side. You can use either stairs or the elevator to go to the 4th Floor. The building entrance door opens automatically. However, the next door needs to be opened manually. Once you pass them, there are two elevators on the righthand side. Press the button and choose 4th floor (it is where our welcome/reception area is located). There is a grey door on the right when you exit the elevator on the 4th floor; they remain open. The glass door at the end of the short corridor can be opened with a badge. 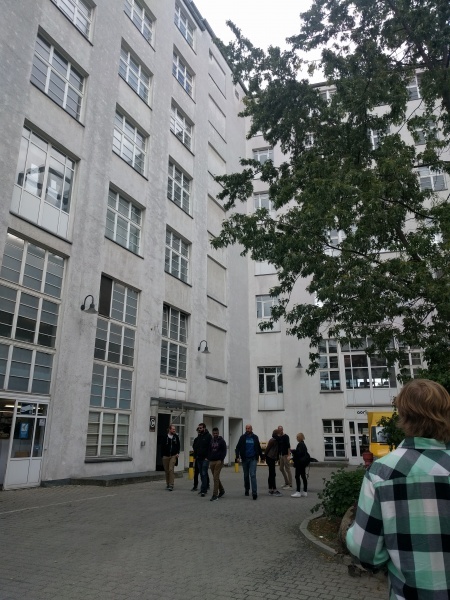 There are two floors in the office connected by an internal stairwell. If you want to use the kitchen or event space on the 3rd floor, please take the same elevator you used to get to the 4th / reception floor. There are 2 accessible toilets, one on each floor. -3rd floor- On the lefthand side as you enter the event & community space. -4th floor- On the lefthand side as you enter the reception area. 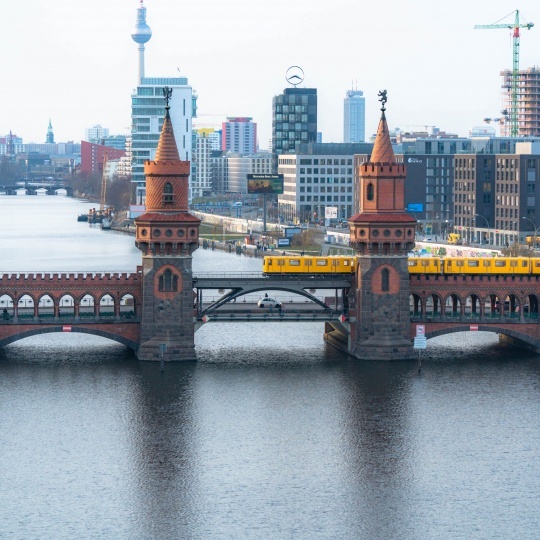 Tegel is closer to the city center and has service from transatlantic flights (Brussels Airlines, United, Air Canada Rouge) as well as many normal-cost air carriers. Some flights departing from terminal A allow you to get very quickly from the gate to the waiting lounge because each jetbridge has its own gate, security, and lounge. All other terminals in Tegel take a little longer. Schönefeld is a little further from the city's center, but also has a very easy connection to the office. Schönefeld is primarily served by low-cost air carriers (Ryanair, Easyjet). Berlin is also well connected by train. The closest major station for long distance and international trains is the Ostbahnhof. If the train does not stop at Ostbahnhof, then the Hauptbahnhof is the next best choice. Indicating the next local train ("S-Bahn"), subway ("U-Bahn"), or bus station. The transit authority in Berlin is VBB. Most inner city services are operated by BVG and S-Bahn-Berlin. There are three fare zones in Berlin: A, B, and C. A is the inner city, bounded by the Ringbahn (S41/S42). B is between the Ringbahn and the Brandenburg border. C is Brandenburg. Tickets are sold as AB, BC or ABC. An AB or BC can be extended to the third zone with the purchase of an "Anschlussfahrausweis". This also applies to single rides in concert with a flat rate (daily/weekly/monthly) ticket. A ticket from BVG/S-Bahn-Berlin can be used on regional trains within the ticketed zone. These are trains which have a number like "RE1" or "RB1". They are primarily operated by DB Regio (mainly red), ODEG (grey with yellow lettering) and NEB (blue and white). A single ride ticket is valid for two hours, but only for one direction. Day tickets are cheaper when taking three rides or more. Also: buying tickets in sets of 4 gives you a decent deal. Day tickets for groups up to five people are dirt-cheap. Multi-day tickets (regular ones or the "City/Welcome" variety which allow rebates in certain museums and restaurants) are not really a good deal. Every ticket machine also sells special tickets, but they're hidden in sub-menus. Keep digging! Most support changing to English on the main screen. Remember to always validate your ticket before boarding a subway, S-Bahn or regional train. Ticket validation machines are located near the ticket machine itself and on the platforms. Most ticket machines accept coins. Ticket machines might additionally accept a combination of credit card, banknotes <= 10€, any banknote and EC card (German debit cards). The single best public transportation app for Android is Öffi. It covers all of Germany and is available for free through Google Play. Open "Öffi Directions", choose My current location as starting point and Schlesisches Tor (U-Bahn stop close to the office) or Taborstraße (bus stop directly in front of the office) as your destination, and you should be good to go. There's also the BVG Fahrinfo app, which is BVG's official transit app. This app gives really good transit directions as well as schedules. You can also buy tickets directly from the app. The recommended route from TXL to the office is via the S-Bahn ring. From the airport, take bus TXL to S Beusselstraße (2 stops). From there, take S41 (via Gesundbrunnen, Ostkreuz) to Treptower Park. From there the office is only 10 min walk away: go right on Puschkinallee and keep straight (it's a beautiful walk!). You can also take bus 165 (direction U Märkisches Museum) or 265 (direction U Stadtmitte ) to Taborstraße. This will leave you right in front of our office building. The recommended route from SXF is via S-Bahn route S9. From the airport, take the S9 to Treptower Park. From there the office is only 10 min walk away: go right on Puschkinallee and keep straight. You can also take bus 165 (direction U Märkisches Museum) or 265 (direction U Stadtmitte ) to Taborstraße. This will leave you right in front of our office building. The recommended route is the S5, S7 or S75. All of these stations are on all of these routes. From the station, take the route to Warschauer Strasse station. From Warschauer Strasse station, either walk or take the U1 one stop to Schlesisches Tor U-Bahn. If you know you need to take a lot of taxis while you are in town, we suggest downloading the MyTaxi app. You can filter taxis by who takes card, how many people you need to pick up etc. Most taxi rides within central Berlin are around 10 EUR, hardly more than 15 EUR. http://michelbergerhotel.com/ 15min walk from the office. Great location, great hotel. Free yoga class on Thursdays, make their own coconut water. Delicious food (local and made from scrap) and drinks. Rooms range from "Cozy" (very tiny but beautiful and has everything you need) to a larger scale. More hipster vibe. Very different from your usual hotel. It's an experience in itself. https://www.hotel-johann-berlin.de/ in Johanniterstrasse (U1 Prinzenstr). This is definitely outside of walking distance, but if you take the U1 towards Schlesisches Tor, you are close. It is customary in Germany to tip a little by rounding up and around 10% at restaurants for good service. Tipping in bars is not something many Europeans do. Not many places accept Credit/Debit Card. Many smaller restaurants and shops do not accept credit cards like in the US and other larger European cities. Please be prepared to pay in cash. It's a good practice in Berlin to ask in advance of making a restaurant reservation if they accept credit cards. Museum Insel  - 'Museum Island' is a unique complex of 5 significant national museums on the Spree Island. It is on the UNESCO World Heritage List. Take one ride around the S-Bahn-Ring. Train lines 41 or 42. A public transport ticket (region AB) is only 2.70 EUR. The full circle takes about an hour and will show you many facets of the city and you'll see people from all walks of life. Berliner Unterwelten – awesome guided tours through old bunkers and other abandoned, mostly underground places. Waterside dining space with wooden decking over the water, comfy rooms, serving an eclectic menu. Delicious and fast burgers right at the U1 Schlesisches Tor. Typically Berlin fast food place serving pork sausage with curry ketchup. For all you chiliheads out there: This is the place to get spicy hot currywurst in the city. If you don't know what you're doing (and especially if you think you do), start with a "number 3", maybe a "number 4" if you're daring. Unless you're a trained capsaicin pro, you're unlikely to make it past level 6 without bad things happening to you, so please be careful! The food trailer style restaurant is located in the middle of a huge, busy intersection right next to an S-Bahn stop. Seeing people from all walks of life rush by while your mouth is slightly burning is part of the charme of this weird culinary Berlin gem. US style burgers made from freshly ground beef. This restaurant is serving some of the best burgers of the city. The place can fit larger groups, but be sure to reserve a table even with small groups, because the place has a reputation and it gets crowded past 19h. Simple and tasty South German cuisine. Located in Mitte, close to Rosenthaler Platz and Hackescher Markt. If you would like to see traditional German restaurant and try creamy potato soup, 'Berliner style' grilled sausage or oven-fresh apple-strudel, this place is for you! Excellent Indian Food! Can accommodate medium to large parties with a reservation. If you’re looking for a bar with craft beers from Berlin, Germany and all over the world you should check this one out. It's quite close to the office. Craft beer bar in Prenzlauer Berg with a focus on German craft beers. Craft beer bar in Prenzlauer Berg with a focus on Belgian craft beers. Craft beer bar that focuses on their own brews. Another craft beer bar in Prenzlauer Berg, this one focussed on Italian brews. Craft beer bar in Mitte. Very central, so it can become quite crowded, so try to come early. Focus is on US and English beers. Micro Brewery and bar in Wedding selling their own beer (and teaching you how to brew yourself, if you care). Slightly more exotic than the rest and somewhat far out, but you're essentially sitting next to the beer brewing pots you're drinking from. This is the place to be if you're into exotic IPA style brews. Very, very German and not nearly as bad as it sounds. They serve decent foods and very tasty beer from their own micro brewery. Pro-tipp: order a "Bierprobe", which is a small sample of all their beers. Located right next to S-Bahn stop Hackescher Markt and in walking distance from Alexanderplatz. The place has a nice, but slightly hidden outside area in the back. Awesome, awesome cocktails in Friedrichshain, about a 25 minute walk from the office to the North. Be prepared to get a personal cocktail "fitting" to your taste. Bar has a decent foosball table, btw. Easily one of the best cocktail bars of Berlin, perhaps even the best. About a 15 minute walk from the office to the South-West. Cocktails are tailored to you taste, and please don't even think about ordering a Margarita, as these highly-skilled people have better things to do than making standard cocktails. It's really quite the taste experience. The place is tiny, so you need to reserve a table or go early. Don't expect to fit large groups, though. Six or eight is probably the max. Good Cocktails and live music in the heart of Kreuzberg. The Forum wine bar is super cool. You pay 2EUR when you enter and you drink as much wine as you want and eat from their small salad bar. In the end, you pay what you feel it was worth. Done! Where all the hackers hang out. Smoker's bar. Pro-tipp: order a "Tschunk" (Caipirinha with Club-Mate). It's close to S-Bahn stop Hackescher Markt in walking distance from Alexanderplatz, and easy to miss with the entrance hidden deep inside the backyard. Mozilla's Berlin office is home to Mozilla's first dedicated maker space. Swing by if you want to learn, share or just make something. One of the youngest maker spaces of Berlin located near S-Bahn stop Warschauer Straße. It's just a 15-minute walk from the office. The space is very active and we hear that people there are unusually friendly and welcoming. 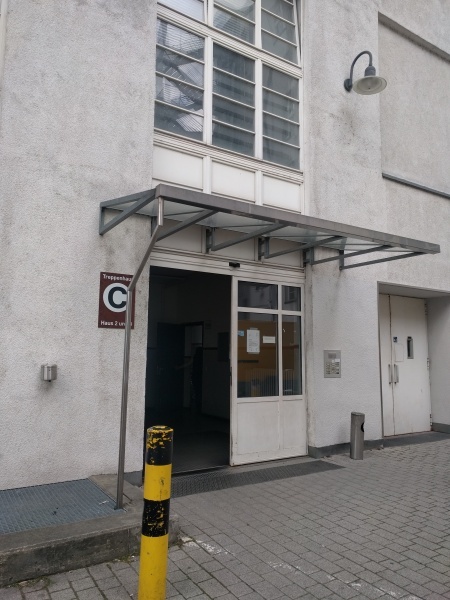 The largest hackerspace of the city located directly on the river Spree near Subway/S-Bahn station Jannowitzbrücke. It's not easy to find because it's located in the second backyard from the street. Open every day, it has regular and irregular events on most of the evenings and parties on the weekends. The included bar also sells the legendary "Tschunk". Need to quickly machine your metal parts, 3D-print a case for your electronics project, or sew your pants? Or reverse-engineer your DNA in a biolab, smell the vegetables or just hang out in the hot tub of a massively green backyard garden? The "Space Agency" is one of the most well-equipped fablabs you'll find in this country, and always worth a little visit. Finding the office (location on OpenStreetMap): Use driveway Schlesische Str. 27 (see photo). Walk along the cobblestone path all the way to the end. We are in the white building, and the entrance is on the left side right before the path ends (see photo). Enter through the door marked "Treppenhaus C" (see photo), and go up to the 4th floor. 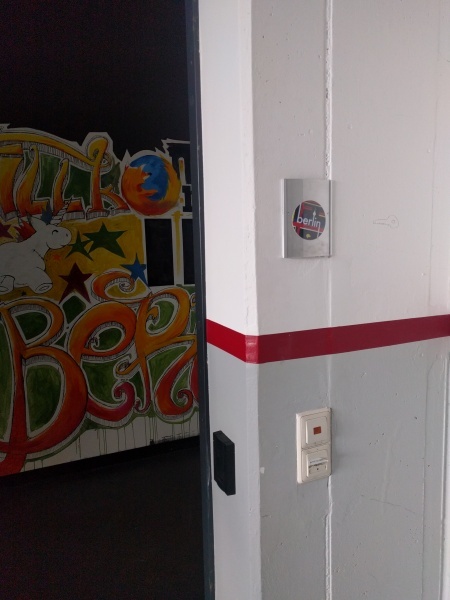 The door to the office is marked by a Mozilla Berlin sticker (see photo). Bikes: Our office is also bike friendly! To access the bike shed, enter through the 'third' floor, if you don't want to use one of the many racks outside of our building. We also have a bike for guests!